It's nice to still see the stars of Descendants of the Sun around in editorials a few months after the drama ended because it didn't seem like they did all that much promotion during the show's blockbuster run. And they didn't need to. I'm especially excited to see leading lady Song Hye Kyo following up her stunning Elle pictorial with a striking appearance in W magazine. Vogue tagged along with Song Joong Ki as he made his way to Hong Kong for the Dior Homme FW 2017 fashion show. Of course he was dressed in Dior. Sometimes he looks so mature and at other time s he still appears ever so youthful. The GooWon couple otherwise know as Jin Goo and Kim Ji Won have been no strangers to the magazines lately either. There have been rumors that if there is a second season of Descendants of the Sun, the secondary couple will be promoted to the leads. Now this roundup isn't all about DOTS and there are also a number of takes from other recent celebrity editorials. I've gotten questions, about why I feature certain celebs and not others. The answer is simple. I only feature people that I happen to like or admire in some way. This is a great portrait of Jin Goo for Arena Homme+. It was recently announced that the actor's wife is pregnant with their second child and his next project will be the action thriller One Line which also stars Siwan of Misaeng fame. Kim Ji Won goes retro glam in Sure and everything about the hair and makeup to the styling in this shot is sheer perfection! I totally covet her entire outfit especially that metallic pink moto jacket! 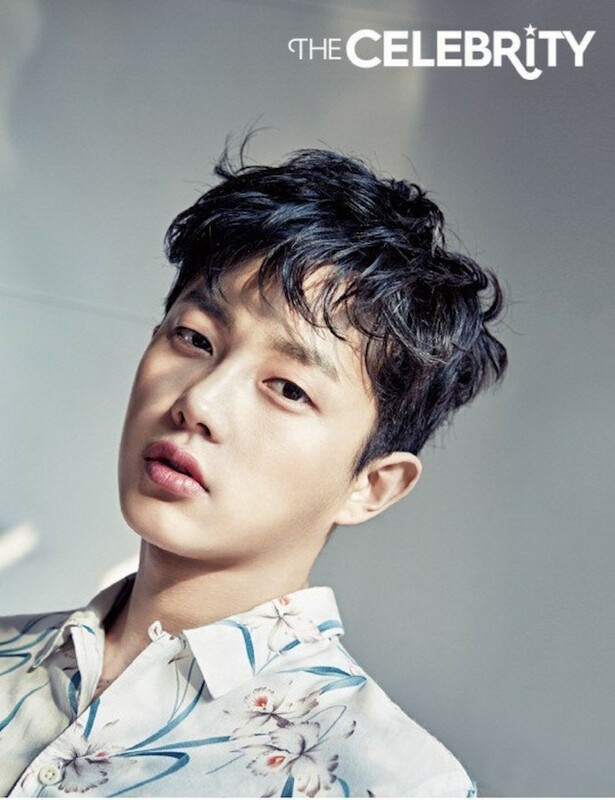 Kim Min Seok who was the adorable Private Kim Ki Bum in DOTS slips into flower boy mode in The Celebrity. The 26 year old actor is currently appearing in the Park Shin Hye drama The Doctors which I have absolutely no interest in. He moved into a new home last month and revealed that he was gifted a refrigerator and and a washing machine by Song Hye Kyo and Song Joong Ki respectively. Now those are some super nice housewarming presents. It's really cute how tight the cast still is. Jo Jin Woong is one of those actors who's equally believable portraying a good guy or a a bad one. His righteous Detective Lee was someone to root for in the excellent drama Signal and he is now making a villainous turn as a greedy treasure hunter in The Hunt. Kim Hye Soo definitely held her own as Detective Cha in Signal. I can't believe that she's the older of the two by 6 years. I really enjoyed her performance in how she impressively managed to distinguish the younger and older versions of her character. In a meta turn, she will be playing the role of an actress next in the film Familyhood. InStyle magazine went backstage at the 52nd annual Baeksang Arts Awards for cool portrait series featuring some of the notable attendees. This image of Han Hyo Joo was one of my favorites. Not only does she look beautiful but her styling was flawless and really elegant. 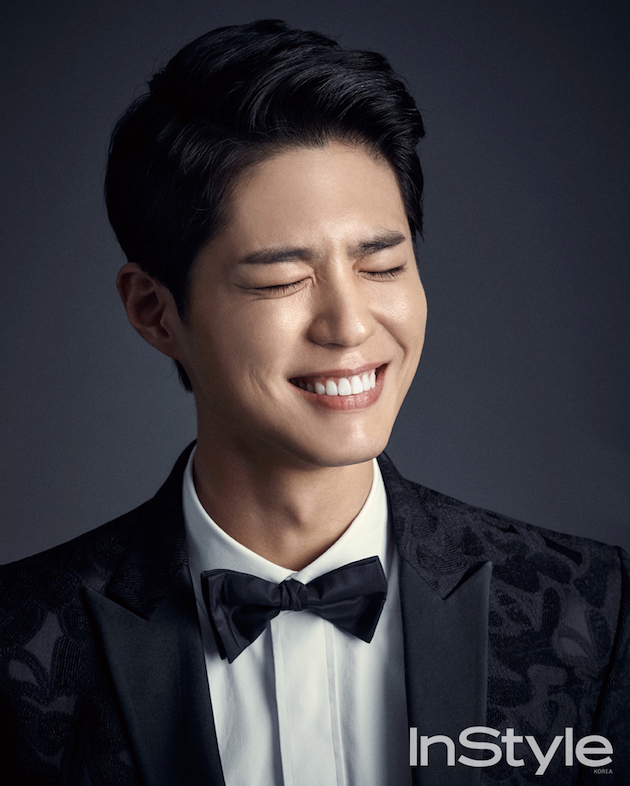 Park Bo Gum has such a dazzling smile. I've only seen him on variety shows and he always comes off so well mannered and exuberant. His styling is on point as well. Love the dapper brocade tux and the hair style as well as the color. Black is so much better than that unflattering orangey brown that so many K-stars (or their stylists) seem to like. Yoo Ah In was a big winner for the lead actor in a television series for Six Flying Dragons. Some people felt like Jo Jin Woong should've won but Yoo Ah In did have to carry a 50 episode series and it was also a ratings winner. This BTS pic he shared with his fellow winners and friends on Instagram was adorable. He sat with the SongSong couple during the ceremony and acknowledged them in his speech. They share the cutest friendship! It's so weird to see her dolled up so feminine after watching her in that army uniform for so long! Hehehe. I too am totally coveting that pink moto. It is so strange seeing all these people on your blog. I had zero idea who they were until I started reading here and now I start to recognize them. Park Po Gum really has a million dollar smile! First of all, SJK and SHK...I honestly have not seen a bad photo of these two, Rowena! They just look so perfect. It's really great to the whole cast getting the accolades they deserve, and even better to hear how nice they are IRL, you know. PS Han Hyo Joo is sooooooo pretty in that pic! Perfect end to the week stunning editorial. Have a great 4th of July doll. Great pics, cool roudup Rowena! Nice pics! Everyone looks so elegantin their photos! one day i will watch this show. it's on my list!! My favourite amongst all will be Kim Hye Soo, that editorial is beautiful and I must say that I have highest respect for actors like Jo Jin Woong who is very versatile and can carry both good and bad characters really well. Some actors are limited to certain roles and it's rare that we see one who is believable in different sorts of characters. Particularly in love with Song Hye Kyo pictorial on W mag. What a great editorial so many beauties. I really like this post as I may not know some of these talented stars. I love the editorials. Instyle mag's image of Han Hyo Joo is my favorite. Very beautiful. Thanks for sharing Rowena and happy new month babe. Oh I LOVE what Jin Goo is wearing the white frock with those semi mary jane shoes is so cool. I get to see so many cool clothes unclose at my job. Designer clothes really are on another level. Know I didn't see the email but yes I can do Thursday. Amazing pictures. I am totally loving the jacket in the first picture. These are great photos! I really love that glittery pink moto jacket too! I'm always fascinated by actors who are versatile and can play the good and the bad guy equally well. Anyway, all of these editorials are beautiful! ...love that pink jacket Kim wears! Such a great outfit altogether. han is beautiful! i am not familiar with them, but thanks for the eye candy! Song Joong Ki looks amazing in that jacket & shirt! It just proves his versatility (ability to look mature & youthful). I love that pink motto jacket also Rowena! They are very popular right now. I follow a fashion blogger that has many of them. She wears them in different colors and they are beautiful. I'm glad you do posts like these, because it's introducing me to a number of talented actors (I was unaware of). 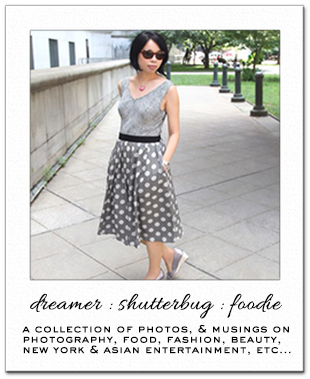 I can't believe someone questioned you about who you choose to showcase on YOUR blog. OMG'd...people have no shame! Of course you will feature only celebrities that you admire! All of these people look flawless. From their hair, makeup, outfits to their smile! It's really impressive that you have different feelings for all of them. From all the photos above my favourite is the one of Kim Hye Soo! Such a neat and beautiful look!